Earlier this week, a west coast buddy and Trojan fan ribbed me for Florida’s two non-conference November games. I responded that we were certainly embarrassed by the fact the Gators have only played the #5, #7, #8 and #9 teams in the current BCS standings with #10 still to come. We must be scared of playing any of the top 4. Soft. According to the NCAA, Florida has the #1 ranked strength of schedule in the country. So when idiots like my friend or the knuckledragging Florida State honks on Twitter try to throw Lafayette or Jacksonville State in your face, you know how to respond. 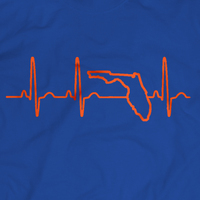 For the Gators to be sitting at 9-1 right now with the nation’s toughest schedule is nothing short of a miracle. 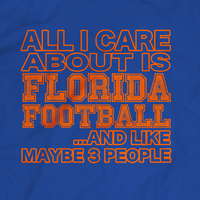 As we are well aware, Florida is a struggling team right now. I fully expect the game against the Gamecocks this week to be closer than the game against those other Gamecocks we played in October. With Jacoby Brissett under center, the already struggling offense will surely frustrate again. But this team fights and claws and will overcome the pride fifth place team in the Ohio Valley Conference and get to 10 wins. Double digit wins in this rebuilding year will be something to celebrate. The other thing to celebrate on Saturday will be the departing senior class on Senior Day in the Swamp. There are 19 that will be honored in the pregame ceremony on Saturday. Certainly, this class will not go down as one of the great ones in school history. They are survivors more than anything, exemplified best by the oldest member of the class, James Wilson. Wilson is so old he was recruited by Pete Carroll and was a huge recruiting coup for Urban Meyer when he flipped from USC to the Gators late in the process. Big things were expected from the big guard from Tim Tebow’s St. Augustine alma mater Nease. But injuries and frustration mounted and Wilson was a textbook example of a “bust” in his first couple of years on campus. Most thought he was headed for a transfer. But Wilson stuck it out, rededicated himself to football and after suffering another knee injury in 2010, he came back in 2011 and was granted a medical redshirt for 2012. Wilson will finish out his sixth year in Gainesville with Saturday’s contest, having seen the ultimate apex his redshirt freshman year in 2008 and the absolute nadir last season. Another survivor is Caleb Sturgis. He is the other connection between this year’s team and that 2008 championship team, handling kickoff duties his freshman season. Like Wilson, Sturgis battled through injuries and came back better than he was. Sturgis is now in the conversation as Florida’s best kicker ever and will surely earn All-American status and perhaps the Lou Groza Award after this season. He may get the loudest ovation on Saturday. And something to watch in April… Sturgis might be the highest drafted Gators senior in the 2013 NFL Draft. While Sturgis may go down as the best player in this class, the most solid career from start to finish belongs to Jonathan Bostic. He has been a key contributor since he stepped foot on campus, leading the team in tackles in his very first game as a freshman. Bostic has put together a solid college career, even if he never reached superstar status. If Wilson was a recruiting coup for Urban Meyer and Sturgis is a lock for the NFL, what is Omar Hunter? When Hunter signed, Meyer called him the “Tim Tebow” of the class. Hunter was universally seen as not only one of the top defensive line prospects in the 2008 class but also one of the best in many years. Comparisons to Warren Sapp and thoughts of how Hunter would anchor the Gators line for only three years before being a top 10 NFL draft pick were common. But as we all know, recruiting is not a science. Hunter has had a nice career if you remove those expectations. But when you look back on his time here, can you do that? Unfairly, the answer is no. Another guy who moved to Gainesville with the weight of big expectations was Xavier Nixon. After a rookie season in which he earned all-SEC freshman honors, Nixon was going to seal off the blind side for Gators passers for the next few years. It hasn’t worked out that way and Nixon has arguably regressed in his final season. As with Hunter and the rest of these seniors, he’s still had a career to be proud of but there is that lingering feeling of what might have been. Then there are four guys who deserve a spotlight for emerging this year as key playmakers and leaders. For three years, the chants from us and other bloggers to #freegilly were frequent and loud. But while we saw the potential, Steve Addazio and Charlie Weis did not. So it took until his senior season but finally Mike Gillislee has been given the workload, and despite sketchy offensive line play, he has not disappointed. Gilly is in range of becoming Florida’s first 1,000-yard rusher since 2004 and only the 8th player ever to do it in Gators history. With not quite the same fanfare, Josh Evans’s emergence has been just as important to the Gators success. Evans solid play deep in the secondary has given Matt Elam the ability to roam the line of scrimmage and make plays. Evans has come up with big tackles and big turnovers all season long. His story is one of classic college perseverance since he contributed little his first two years, stepped into a bigger role his junior season and emerged as a leader in his final year. I’ll lump the last two together. Lerentee McCray and Omarius Hines have had moments this year where they were the best players on the field and were instrumental in helping the Gators at crucial junctures (Hines TD run against Mizzou, McCray’s menace of LSU’s backfield). Both are great examples of the depth of this team and how so many different players have contributed to the team success this season. The rest of the class – Nick Alajajian, John Crofoot, Cole Gilliam, Christopher Guido, Frankie Hammond, Earl Okine, Scott Peek, John Reichardt, Sam Robey, Jesse Schmitt – all deserve praise for contributions in games or on the practice field. As seniors, they deserve credit for buying into the change in regimes from what they were recrutied for to what they’ve become this season. At worst, they will have lead a 7-6 team to a 10-3 record the following season, one the biggest improvements year-to-year in school history. Of course, these guys are not going to be the only ones who play their final game at Ben Hill on Saturday. Matt Elam, Shariff Floyd, Jordan Reed and Dominque Easley are certain to look into their NFL futures with Elam and Floyd the most likely to make the jump. Their departures would be bigger losses than any of the seniors but we’ll have time to mourn and cope with that after the season. For now, the focus deserves to be on Senior Day. So arrive early and stand and cheer for all of them. They are Gators and we are proud of all of them. This entry was posted in Uncategorized and tagged Florida Gators, RPI, Senior Day, Strength of Schedule, Top 25. Bookmark the permalink.